"But prosecutors said he showed enthusiasm and initiative in deciding to drop the fake bomb given to him by undercover agents." I wonder what the reaction would be if federal agents chase Jews all over America hoping to be able to entrap an individual Jewish kook in order to declare yet another victory for the "war on terrorism". Is that what they have been doing with Muslims since Sep. 11? Entrapment is a legitimate method but not when directed at members of one faith only? It is not that there are no kooks among Christians, Jews, and Buddhists and others, you know.
" Each year, a maximum of 1,800 exemptions will be granted to boys who are considered Torah prodigies out of the roughly 8,000 eligible annually for service. Ultra-Orthodox girls will not be conscripted. They follow strict rules of modesty, and many marry in their late teens." From "Ibn Rushd": Michel Edde has a short piece about the fall of Constantinople to the Ottomans in 1453. He's still mourning. He says Charles Helou while in office never signed any document on Tuesdays because Constantinople fell on a Tuesday and that day should hence always be considered as a nefarious day! "Le mardi est aussi considéré comme un jour néfaste durant lequel on ne se livre à aucune activité notable, et on ne signe aucun document privé ou public important. C’est ainsi qu’agissait par exemple le regretté président Charles Hélou." see also the reader's comment in bold characters". Other aspirations of Syrian "revolutionaries"
Arabic translation of comrade Joseph Massad's The Last of the Semites. "Relying on the term "no-fly-zone" is typical in journalism. But that is a mistake. It obscures the gravity of the news." "Does anyone think he'd describe Syrian planes bombing a U.S. aircraft carrier as "obviating" our naval assets?" "I trust "start a war against Syria" would poll poorly. That's why advocates of that course hide the consequences of what they propose behind a euphemism." "The police raids were carried out in Turkey's largest city Istanbul as well as in the southern provinces of Mersin, Adana and Hatay near the Syrian border, said Adana governor Huseyin Avni Cos. Cos said unknown chemical materials were found during the raids and sent away for investigation. He denied media reports that a small amount of the nerve agent sarin had been uncovered." "Earlier, several Turkish newspapers had reported that 12 people from Syria's al Qaeda-linked al-Nusra Front who allegedly had been planning an attack inside Turkey and were in possession of 2 kg (4.5 pounds) of sarin, had been detained in Adana." Al-Arabiyya (the station of King Fahd's brother-in-law) aired a footage of a man who experienced nausea. He said he was certain it was chemical weapons. "Syrian soldiers killed three Westerners - reportedly the British man, the American woman, and a third person of unidentified nationality - in northwest Idlib province near the Turkish border, a monitoring group said late last night. "They were shot dead during an ambush in the Idlib region and the army found them with maps of military positions," said Rami Abdel Rahman, director of the [UK based, anti-Assad] Syrian Observatory for Human Rights." "“They call us the silent majority,” Mr. Masri, chairman of the Palestine Development and Investment Corporation, said at the news conference earlier." You are neither silent nor a majority. So please just go away and retire on some Israeli colony. Anne Barnard and Neil MacFarquhar report on serious concerns for Israel. This should be dubbed "Poor Israel Feature"
"...sophisticated S-300 air missile system — of particular concern to Israel because it could compromise its ability to strike Syria from the air..." Poor Israel. You mean it may not be able to attack and bomb from the air? That would be most unfair and most inhumane. This must be a serious concern for Israel and for its propagandists in the Western press. I mean, why would not Israel be allowed to invade and bomb and raid, damn it? Is that not a basic right for any country? They are picking on Israel, don't you think? Syrian "revolutionaries" don't want democracy after all. No kidding. "Most Syrian rebel fighters do not want democracy and the country's civil war is producing ever worse atrocities and increasing radicalization, independent U.N. investigators said on Tuesday." One of the dumbest, and most common refrain, in Western and some academic discussion of Hizbullah's role in Syria is the notion that the Lebanese Shi`ite community is up in arms about that intervention. This has been the thread in Hariri media and is being circulated in all Western media. The same Hariri media (especially in Now Hariri and in editorials in Daily Star--owned jointly by Hariri family and Hamad bin Jasim) have been insisting since 2005 that the Shi`ites of Lebanon are about (in a week or to) to break with Hizbullah. Just consult the Electoral Encyclopedia by Kamal Fghali. Just check the numbers. In fact, the opposite is true: the base of Hizbullah AND Amal have been pushing for intervention, and due to many reasons that don't exclude sectarian factors. The intervention in Syria by Hizbullah has been quite popular by the base, and as reports in As-Safir and New TV have shown, is not viewed as one for the sake of Bashshar but for other larger political consideration, whether you agree with it or not--I know, most of you don't agree with an external intervention unless it has the stamp of approval from NATO. For some reason, many Trotskyists--but not all--are very keen on NATO interventions. An interesting take on Hizbullah intervention in Qusayr by Elias Muhanna. What is quite galling about Western media coverage of Syria is that extent to which it is a replica of Saudi propaganda media. Who would have thought that. They feel that they have to cover up whatever shortcomings and weaknesses and failures by the opposition. Notice how the reports of the advances by Syrian regime troops are only being reported in a handful of papers around the world. The rest have only reported yet more successes and advances by armed groups. We should have known that the Syrian regime was more resilient than what was being reported in Western press. There were many signs that the predictions of the imminent fall of the regime (next week, at most) were far more premature. But two signs were important: 1) defections remained miniscule that propagandists in Western (and gas and oil Arab) media were jumping up and down whenever a mid-level clerk defected. 2) there were no wholesale defections of units within the Army. When people decide that the regime is falling, they take steps to make that decision known. We are now in for the long haul, and that maybe what the US and Israel want for Syria, promises of liberation notwithstanding. I have received on Whatsup videos of Hizbullah fighters n Qusayr. They show fighters talking about their mission and joking around and one has a Pepsi in hand joking that they feel that they were not under stress and such. (That man was later killed, I am told). I know that nothing that comes out of the Fee Syrian Army buffoons-in-uniforms can be taken seriously, and I know that the Army has only proven its abilities in the art of "tactical withdrawals" but whatever happened to the 24 hours ultimatum issued by none other by US-favored Gen. Idriss? You know that it expired. This is a very informative report on Nusrah Front. "Le vrai défi consiste à moderniser l’islam. Je n’ai pas de réponse, mais on devrait y parvenir à travers une pensée critique capable de remettre en cause, voire de détruire, les dogmes obsolètes." From Yago: "According to the pro-Israeli BBC, Al-Ahkar is pro-Syrian. "the pro-Syrian Lebanese newspaper Al Akhbar reported". This is how Al-Akhbar is identified in the New York Times today. Now, it is known that I don't agree with Al-Akhbar's editorial line on Syria but this is quite inaccurate. If you go to Al-Akhbar Arabic webpage, there is an picture of a Syrian dissident and call for his release from Syrian regime jail. Al-Akhbar has been banned from Syrian government offices for more than a year now, and several of its correspondents have been kicked out of Syria. There has been criticisms published against the Syrian regime in Al-Akhbar (not as much as I would like, of course) but this characterization is not really accurate especially when it is written by people who don't read Arabic and who are not in a position to judge anyway. But that is not why I am commenting: do you know that newspapers that are owned by Saudi princes (Al-Hayat and Ash-Sharq Al-Awsat) are identified in the Times as "pan-Arab" papers? This shows you that even labels are politicized in the Times." "A Jaffa school teacher complained that Superland Rishon Lezion prevented him from buying tickets for Arab students, a complaint which was followed by the amusement park's management admission that the park is open to Jewish schools on certain days and Arab schools on other days. The park management released another statement on its Facebook page Thursday morning, announcing that the policy, which provoked fierce public criticism, will be reexamined." The story of Aljazeera's decline is not surprising: I am surprised that Aljazeera, in its eagerness to bring down the Egyptian and Syrian regimes, fell so fast and lost so much viewership. I was talking to Aljazeera anchor last week, and he said that the decline is due to the rise of local channels, as in Egypt. I said that is true but Aljazeera's crisis is largely due to its crude propaganda in the last two years. He did not seem to disagree. So the US government yesterday officially and firmly called on Hizbullah to withdraw its forces immediately from Syria. I wish it were that easy, I would have asked the US government to withdraw all its forces immediately from some 156 countries in the world. So the US find it justifiable to send thousand of troops to Iraq and Afghanistan in the name of its security but is outraged that Hizbullah would send fighters across the borders. Wait: does the US also call on Saudi Arabia to withdraw its forces immediately from Bahrain? "How do you assess the roles of Qatar, Saudi Arabia, Jordan, Lebanon, Turkey, and Iraq in the Syrian crisis? Comrade Amer wrote this on facebook and it is true: If the Syrian regime is as unpopular as the Mubarak and Bin Ali regime, do you think it would have lasted as long, notwithstanding Iranian and Hizbullah support? I mean, really. If the US, Israel, and all GCC countries were to have intervened to save Mubarak, he still would not have been preserved, and the US knew that, otherwise it would have dispatched its troops to keep him. Do you really still believe that the Alawite members of the military is what keeps Bashshar in power? If masses of people take to the streets in the Damascus for weeks on end, the regime would crumble. Obviously the situation in Syria is far more complicated, and made more complicated with the heavy handed foreign intervention (by the way, why does foreign intervention only mean support for the regime and not the extensive foreign intervention on the other side?) and the rise of the Bin Ladenite kooky Islamists. You know Aljazeera is in trouble when it has to invent a survey of viewers to prove its popularity. I mentioned this survey released by the network and I suspected it was not true (a few weeks ago). Here, this article is saying that one of the firms cited denies it was involved. This has been noticed by regular leaders: how Aljazeera switched the results of its on-line poll about Hizbullah in order to turn it against the party. Here, Al-Manar TV did an investigation of the matter to demonstrate the fraud of Aljazeera. PS I know that Al-Manar is considered (by me at least) dumb media, but don't they have something better to do? I mean, really? "McCain told CNN that members of the extremist group represent only 7% of the 100,000 total rebel forces." He said that percentage was 6.556367% last month but increased a bit this month. McCain promised to provide weekly estimates of the percentage of the bad elements. For those who asked me for a source on the Jaffa mass grave. Here it is. Hear Ye. Hear Ye. Read all about it. An Arab woman have curls. How bizarre is that? 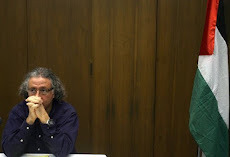 "Terro, on the other hand, is the antithesis to traditional politics. Sporting a head full of curls, rather than a sleek Lebanese style..." Are you serious? An Arab woman with curls? No way. "At least $18.5 trillion is hidden by wealthy individuals in tax havens worldwide, representing a loss of more than $156 billion in tax revenue, according to new figures published today by international agency Oxfam. The missing money is twice that required for every person in the world to be living above the $1.25-a-day "extreme poverty" threshold." 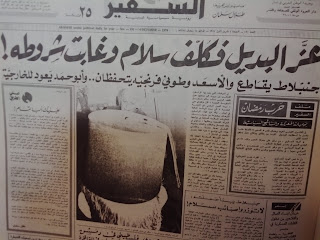 I was reading old issues of As-Safir newspaper. This is from 1974. 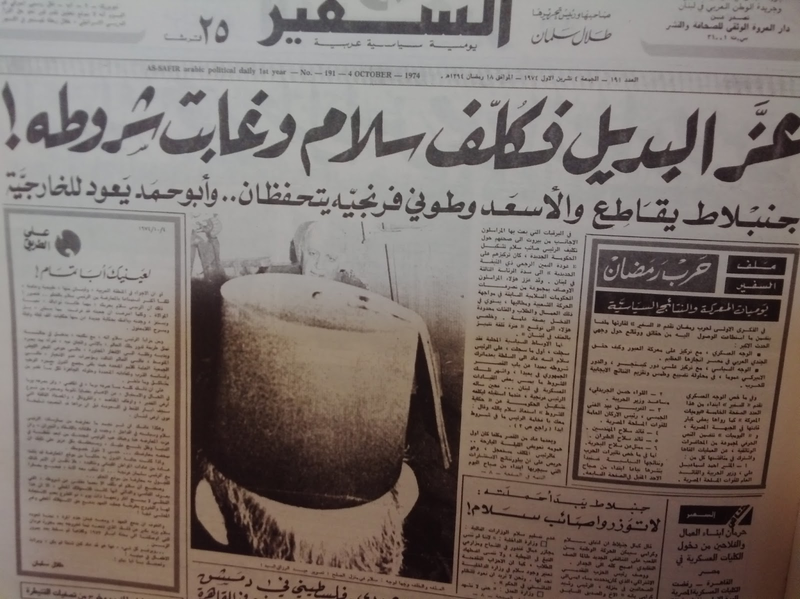 It struck me: the headline talks about the designation of Sa'ib Salam (Tammam's father) as prime minister, and it mentions Kamal Jumblat (Walid's father) and Toni Franjiyyah (Sulyman's father). So the sons still dominate Lebanese politics 40 years later. Only the Shi`ites were able to discard their traditional leaders. In the second half of the same front page of the paper, it talks about the Saudi King (brother of King `Abdullah) and mentions Hafidh Al-Asad (Bashshar's father). Something is wrong, very wrong with this picture. From a reader: "I was going to send u this to say you were wrong about the cpj, then I read it and was very saddened by the language they used almost excusing her killing." the unreported sides of the Syrian "revolutionaries"
"To us, a rebel fighting against tyranny doesn’t commit the same sort of crimes as the regime he’s supposed to be fighting against. He doesn’t loot the homes, businesses and communities of the people he’s supposed to be fighting for. Yet, as the weeks went by in Aleppo, it became increasingly clear that this was exactly what was happening. Rebels would systematically loot the neighborhoods they entered. They had very little regard for the lives and property of the people, and would even kidnap for ransom and execute anyone they pleased with little recourse to any form of judicial process. They would deliberately vandalize and destroy ancient and historical landmarks and icons of the city. They would strip factories and industrial zones bare, even down to the electrical wiring, hauling their loot of expensive industrial machinery and infrastructure off across the border to Turkey to be sold at a fraction of its price. Shopping malls were emptied, warehouses, too. They stole the grain in storage silos, creating a crisis and a sharp rise in staple food costs. They would incessantly shell residential civilian neighborhoods under regime control with mortars, rocket fire and car bombs, causing death and injury to countless innocent people, their snipers routinely killing in cold blood unsuspecting passersby. As a consequence, tens of thousands became destitute and homeless in this once bustling, thriving and rich commercial metropolis." " "The footage shows Palestinian youngsters around the entrance to the village of Silwad. At a certain point (00:15), a soldier is seen arresting Dar Sa'ad, forcing him to the ground and beating him", it added, "Two soldiers join him and begin punching and kicking the prostrate detainee. The camera is then suddenly shifted in a different direction, where nothing relevant is occurring." "
"Quietly, the Obama administration is building up a vast array of military resources in West Africa, and specifically in Portuguese-speaking Lusophone countries. Reportedly, the Pentagon wants to establish a monitoring station in the Cape Verde islands, while further south in the Gulf of Guinea U.S. ships and personnel are patrolling local waters. Concerned lest it draw too much attention to itself, the Pentagon has avoided constructing large military installations and focused instead on a so-called "lily pad" strategy of smaller bases." "Former American Vice Admiral and Deputy Commander of the U.S. Africa Command Robert Moeller has stated that protecting "the free flow of natural resources from Africa to the global market" is highly important, as well as forestalling oil disruption." "Sectarian violence has spread to a new region of Myanmar, with a rampaging mob torching a mosque and a Muslim orphanage in a northeastern town after rumors spread that a Muslim man had set fire to a Buddhist woman, authorities said Wednesday." "Reports of sexual harassment and assault of women and girls, sometimes by other Syrians, but mostly at the hands of local men, have dogged settlements in Lebanon, Jordan, and Egypt for some time." "As one EU minister puts it: "We thought we were dealing with democratic protests that would topple Bashar al-Assad very quickly. In fact, it's a civil war, and Mr Assad has substantial internal support." "
"“It depends who they will arm,” Yadlin told FoxNews.com. “The rebels can be split into three groups; most of the FSA are secular Syrians -- arming them would be a positive move. There is the Muslim Brotherhood -- a medium risk group; we can still hope they will join the positive post-Assad forces. "And then there’s the dangerous part, represented by the Al Nusra Front, which I hope will not be armed.”"
From Yazan: "Anyways, here is a link to a post on the Brown Moses blog (if you are unaware of it, I highly suggest you keep an eye on the blog). The post has Brown Moses speak to three different chemical weapons experts on chemical weapons use in Syria. Very interesting stuff." Look how Anne Barnard reports (in her daily report on Hizbullah's intervention in Syria) about the indiscriminate shelling of Hirmil: "Four rockets hit this village near the Syrian border on Tuesday afternoon, badly wounding a woman who was sitting under an olive tree in her yard, residents said. Shortly before, gunmen killed three Lebanese soldiers at a border checkpoint in the Bekaa Valley, adding to fears that the crisis in Syria is spilling into Lebanon. Rocket attacks are becoming more frequent in Hermel, and they have killed at least three civilians, including a 17-year-old girl who died in her house on Monday night. Residents said they believed that they were being targeted because Hezbollah, the pro-Syrian Lebanese Shiite militant group, is the political power in the village and bases some operations nearby. But Saad Hamedeh, the son of a prominent tribal sheik in the village, said there were no military targets there. “They are trying to kill civilians,” he said." 1) Notice that she does not mention the identity of the group shelling Hirmil, and it appears as if the shells are just falling from sky, although Fee Syrian Army proudly claims responsibility. 2) Notice that she sticks to her pattern of providing excuses and justifications whenever she feels obliged to report about car bombs or indiscriminate shelling by armed groups. She tells you here that the civilians deserve to die because "residents" blamed Hizbullah's presence, as if Hizbullah members come from outer space and not from the village itself. 3) Notice that she always attributes convenient pro-FSA propaganda to "residents" whether they are in Syria or in Lebanon, and notice that residents are treated as if they are a monolithic group or a political party. "Residents" all agree on one version that always happens to fit into the propaganda scheme of FSA. This picture was taken of a grenade found by a Hizbullah fighter in Qusayr. It shows a grenade with this inscribed on it: "Produced by the blood of the martyrs: Not for sale". By the way, I know I am innocent, but is "the blood of martyrs" a euphemism for Qatari and Saudi funding? Just asking. This has become a common refrain in Western propaganda on Syria: that the Syrian regime (alone) has killed 80,000 or 90,000 or 100,000 of "his own people" (as if people belong to the dictator in power. No questions are asked about the claim or about the accuracy. If your favorite opposition source, the Qatari-funded Syrian Observatory, maintains that some 40,000 or so are `Alawites, what does that say about the claim? I mean, i know that the armed groups have never ever killed anyone in Syria. But I just remembered: do you remember when Western media "reported" that Qadhdhafi may have killed more than 100,000 of "his own people"? What was the actual figure afterwards? I know that the last thing in the mind of Western media is to chronicle and document lies and fabrications by Syrian armed groups. But do you know that--since the US announcement about US of chemical weapons by the regime--Syrian armed groups have been making DAILY claims of use of chemical weapons? Media of House of Saud and House of Thani almost daily report about the use of chemical weapons and always against one person or two only. They show somebody lying in bed and then say: this person was hit by chemical weapons. Apparently, the regime has found it easier to kill or injur someone by chemical weapons than by bullets. Saudi princes are terrified: they just want Saudi King to die. The elevation of the status of Prince Mut`ab has scared them even more. They are terrified that `Abdullah may designate Mut`ab as crown prince before he dies. Director of Human Rights Watch in Beirut, Nadim Houry, sent me a letter of insult in which he denied (see post from yesterday) ever receiving an invitation to attend functions of March 14 in Lebanon. Treat this post as a correction. Can you imagine if this were an Iranian cleric? Can you imagine the international reaction and the resolutions from UN agencies? "Saudis on social networks have called for legal action against a writer and cleric who urged his Twitter followers to harass women cashiers. Abdullah Mohamed al-Dawood, who has almost 100,000 Twitter followers, used an Arabic hashtag on Sunday which read: "sexually harass female cashiers". He advocated harassment as a way of discouraging women from working." When I first came to the US, the ADC (American-Arab Anti-Discrimination Committee), was quite popular among Arab-Americans. The youth joined in large numbers because they felt that this organization was progressive and not beholden to conservative establishment Lebanese-American views. That was before the organization was bought off by Prince Al-Walid bin Talal and other purchasers. Of course, it has been dead long before Sep. 11. I just looked at the program of its next convention: I could not recognize any of the names. I kid you not. Who are those men posing with Sen. McCain in Syria? The report about the men posing with Sen. McCain in Syria. By the way, McCain did not really go to Syria. He just went across the border and took that picture right at the border in A`azaz. 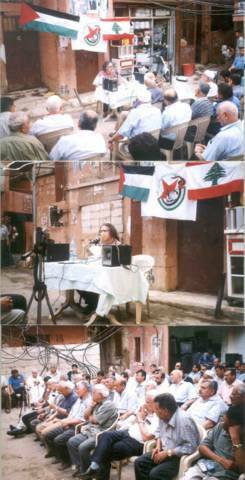 This is the full report by Nawal Berri of New TV in which she identifies the people standing with McCain as the captors of Lebanese hostages in A`azaz. This picture was taken only a few days ago by a Hizbullah fighter in Qusayr. Hizbullah fighters are under strict instructions to not take pictures but many do and many are sending messages through Whatsup. I have received the information and pictures from Qusayr from a sister of someone who was there, who shall not be identified. Here is what I know: that the first two days of fighting was rather easy for the fighters but then they were slowed down. As they continued their advance, they were met by heavy resistance mounted mostly by Chechnyan fighters. The most deadly weapon used against Hizbullah fighters was the method used by Chechnyan fighters: they dig a hole in the ground at the doorstep of the house (as in the hole seen above in the picture), and then they shoot from below at the fighters as they enter. They then shoot them in the head when they fall down. Most Hizbullah casualties were suffered in those encounters (a stupid sleazy--literally in the case of this one--Hariri website did mention that oddly many Hizbullah fighters were shot in the foot, and it stupidly speculated that they were deliberately doing that to themselves to be pulled out from battle, while in reality the party has been receiving more volunteers than it can accommodate). Hizbullah fighters, I am told, were shocked at the state of the Syrian army: that they are so ill-equipped and ill-prepared and ill-supplied. They now say that matters improved for the "battle" and that they now control some 45% of the area. Personally, I don't know how this will go. Nasrallah spoke about "victory" in his last speech, but what is victory for the party in Syria? How would it be defined? I write about this in my weekly article in Al-Akhbar this Saturday. By the way, I noticed that Western media did not report that Hizbullah operative, Ali Musa Daqduq, who was caught by US forces in Iraq, has been released and is now in Lebanon. So I heard on Lebanese TV the other day. New TV aired an explosive report. Its correspondent, Nawal Birri, who has covered the story of the kidnapping of Lebanese pilgrims in Syria, recognized the men standing with Sen. McCain in the picture. They are none other than the captors themselves. The families of the hostages, some of whom were kidnapped with them before being released, also recognized the men as the captors. The picture was taken in `A'zaz, where the hostages are being held. It is not true that all Syrian armed groups have prohibited women from fighting. This Bin Ladenite group, Sawt Al-Haqq, have allowed women to engage in Jeeehad provided they adhere to the appropriate "revolutionary" attire. I see those as the pioneers of the new Syrian feminism, don't you? 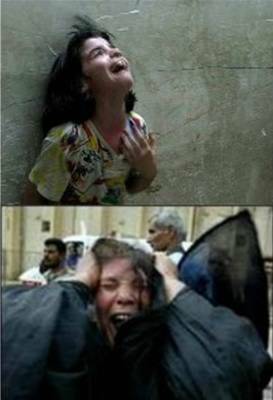 Yesterday, As-Safir talked to the families of those who died fighting with Hizbullah in Syria. Today, As-Safir talked to the families of those who died fighting with Syrian Salafites in Syria. Is the principle of covering two sides so difficult for Western media on Syria? "African leaders believe that the ICC prosecutions "have degenerated into some kind of race hunt" of Africans, African Union chairman Hailemariam Desalegn said Monday." "The Ethiopian prime minister charged that 99 percent of those indicted by the ICC are from Africa and he alleged that the ICC's prosecutors intentionally target African leaders." From Angry Arab's correspondent in Kenya, Buush: "The International Criminal Court on Monday denied an African Union charge that it was racist and said it would not respond to an AU call for Kenyan leaders’ crimes against humanity trials to be moved to their home country. “The International Criminal Court will not be reacting to African Union resolutions,” ICC spokesman Fadi El Abdallah told AFP after the pan-continental bloc urged the Kenyans’ trials be taken out of the ICC’s hands." She won't be made famous. Her name is Yara `Abbas and she was a reporter for Syrian regime TV. She was shot by the heroes of the Syrian "revolution" and there was no coverage of her death: neither in the Arabic press or the Western press. Imagine if she was shot by the other side. Imagine if she worked for a pro-Syrian "revolution" TV. This is her last report. Does anyone notice that this US-favored Syrian general of the Syrian "revolution" was for decades a henchman of the Syrian regime? "To justify the unexpected new sacrifices it is asking from its followers, Hezbollah has framed the risky intervention in Syria as crucial to safeguarding its avowed core missions: challenging Israel, empowering its Shiite community..." Look at the section about "empowering its Shi`ite community. She has been repeatedly making that claim without ever producing an evidence, just has she has for month claimed that Bashshar Al-Asad portrays his stance in Syria as one against "Sunni extremists", although he never once used the word Sunnis. Only when the New York Times was alerted to this invention by Barnard, it felt compelled to issue a wishy-washy correction. The word "empowerment" which is never used in political speeches in Lebanon or in party manuals of Hizbullah was clearly invented by a Westerner. The word belongs to NGO's discourse. Not only in all of his justifications of his party's intervention in Syria, did Nasrallah (or any of the leaders of the party) make that argument. So just made it up. 2) notice the picture: in fact, the Hizbullah salute is one with clenched fists but someone deliberately took this funeral (of a Sunnni fighter with Hizbullah, by the way, although the Times does not report that) to conflate the party with Nazis. The salute of the Phalanges as is their ideology is Nazi but that is not fit to print. 3) She interviews three people in the article: one is an activist and writer for March 14. A businessman with the Amal movement, the traditional rival of Hizbullah. And a most important source of all: "Even in the Dahiya, the group’s stronghold in the southern suburbs of Beirut, a sense of isolation and anxiety is brewing among some of Hezbollah’s deeply loyal supporters...“Where will we go this time?” Umm Hassan said. “There is nowhere to hide. Even if we win there, I don’t see Syria as a safe place for me as a Shiite. We will be killed, if not by the Israelis, by angry Syrians.”" If Umm Hassan turns against the party, the party is finished. It is over for sure. Stay tuned for tomorrow's daily article on Hizbullah's intervention in Syria. But to be fair to Barnard: she always inserts in passing a sentence or a phrase to the effect that there are Lebanese Salafites fighting in Syria. To be fair to her. "Israeli forces on Tuesday detained an 8-year-old from Silwan in Jerusalem, an activist group said." I have told you before that the office of Human Rights Watch in Lebanon is a mere branch propaganda office for March 14. In fact, I am told that the office director has received an invitation by March 14 secretariat to attend some functions of March 14 but that he declined for image reasons. Anyway, the office has released the most lame and the most morally lacking statement about the clashes in Tripoli. Here is what you won't read in that statement: 1) it calls on the US army and security forces to deploy but does not tell readers that it is the Salafites who refuse the deployment and shoot at the army. 2) it calls on all parties to meet but does not tell readers that the Salafites and Hariri MPs have refused to meet with `Alawite representatives. 3) It does not tell you that Salafites begin the clashes every time. 4) the statement says nothing about the sectarian rhetoric and crimes that are inflicted on `Alawites of the region by Salafites and Hariri politicians. I just wish you stayed silent. When Kanaan Makiyya first started to support American wars in the Middle East, Harvard was quick to extend an invitation to him as a fellow, even though he does not carry a PhD and has not finished his studies at MIT--although he uses the name in all of his CVs. When Sadiq Al-Azm was a Marxist supporter of the Palestinian resistance, he never was invited by an American University. As soon as he started attacking Edward Said and advocating colonial democracy, the Zionists at Princeton took notice and invited him, followed by the Wilson Center in DC. Now Harvard has took notice and invited Al-Azm there. What do you expect from a university that extended a fellowship to Amin Gemayyel and to Amram Mitzna.